The ongoing interactive project daddylabyrinth has its origins in the collision between personal history (the author’s relationship with his father and his subsequent life as a father) and software (the Scalar platform developed by the Alliance for Networking Visual Culture at the University of Southern California). 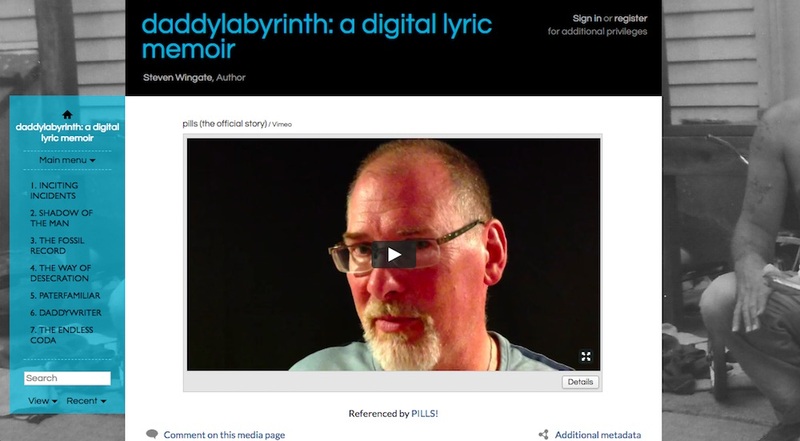 Rooted in both the polylinear strategies of electronic literature and the formal experimentation of lyric essays, daddylabyrinth suggests a space for personal narratives in which authors are free from the constraints and expectations of the classically structured narrative. In this way, digital tools enable a complex depiction of human character that reflects self-contradiction and how our self-perception changes over time. 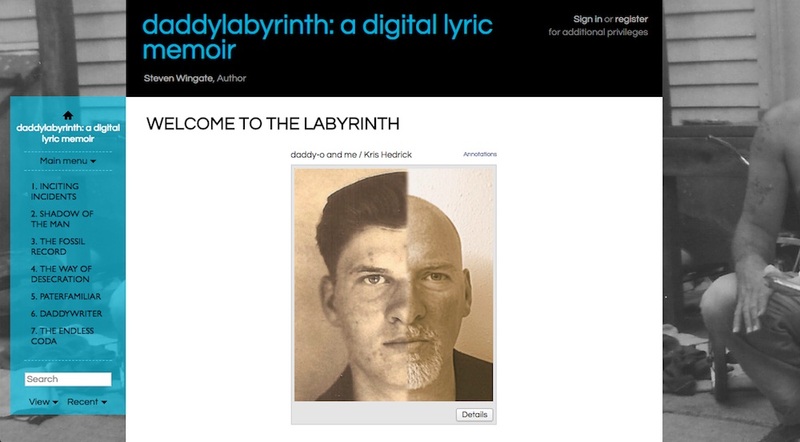 daddylabyrinth is a personal digital work born of an encounter with software. Early in my journey as a father, it became crucial for me to reconcile with my own father, an alcoholic ex-con who died when I was ten. As a traditional (i.e., analog) writer, I had planned and started half a dozen print books to address this topic. I never got far with any of them because my story was not monolinear but—to borrow a concept from Jim Rosenberg—polylinear, and I would only be able to tackle the subject when I had a tool that allowed me to juggle multiple unresolved storylines in a single space. I set out to my first Electronic Literature Organization conference in 2012 to search for such a tool. As luck would have it I saw Erik Loyer give a presentation on Scalar, a platform intended for media scholarship that he was developing with the Alliance for Networking Visual Culture at the University of Southern California. Scalar allows for the creation of multiple interlocking and nested narrative lines, as well as multiple ways to link its nodes. 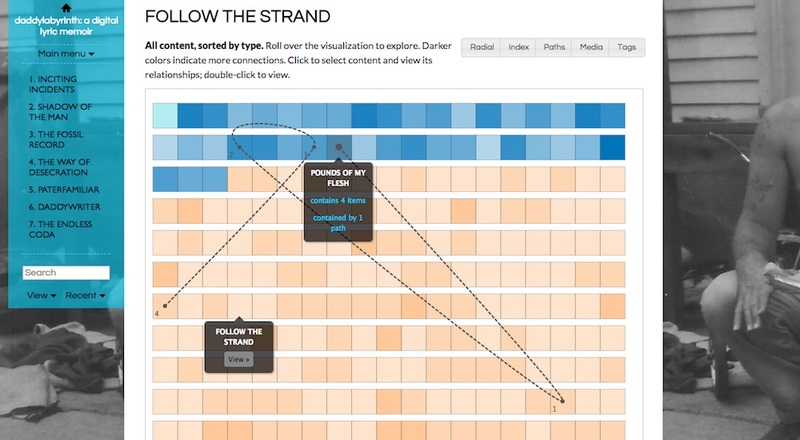 Before Loyer finished his talk, I knew I’d found the tool I needed. Then followed two years of learning how to think digitally, as I had no prior experience in electronic literature. 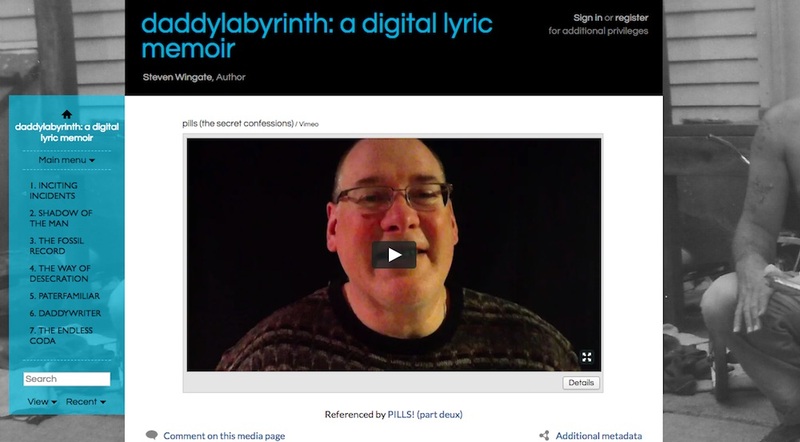 The challenge of daddylabyrinth was discovering how Scalar allowed me to connect the disparate elements of my story—family archive, video selfies, earlier works in analog forms, moments with my own children, etc.—into a polylinear storyworld continuously open to new content and new strategies of arrangement. Its organization of narrative nodes (about 350 at latest count, and growing by fits and starts) had to provide multiple pathways between the Scylla of randomness and the Charybdis of authorial overdetermination, allowing interactors varied opportunities to create meaning through their encounter with the work. Fiction and creative nonfiction—in both traditional and digital incarnations—differ in their relationship to the burden of coherent simulacra. A fictional storyworld requires some semblance of coherence to compensate for the fact that is it not real. Even if we don’t demand verisimilitude from such storyworlds, we do demand coherence. Many fiction projects have fallen apart because their simulacra don’t hold up to scrutiny, and the ones we accept are often praised precisely for their solid storyworlds—in other words, for the coherence of their simulacra. Strangely (but beautifully), we have no such need for coherence when it comes to creative nonfiction. We assume that a nonfiction story unfolds within the set of social and emotional constructs that we accept (though sometimes grudgingly) as reality. We live in an incoherent world, and are ourselves mostly incoherent creatures, so we’re perfectly at home when encountering works of creative nonfiction that don’t require—or even offer—the meticulously created worlds of fiction. The burden of coherent simulacra is therefore lifted, freeing digital creative nonfiction from the need to resemble anything but the self-contradictory and not-quite-ordered selves that we are. One of the great pleasures of working on daddylabyrinth is the opportunity to connect story nodes without needing to make the same kind of narrative sense that I expect from my simulacra-dependent monolinear fiction. I can jump around, return to the center, fall off of cliffs. I am free to be as messy as my mind, as messy as human society. In daddylabyrinth I can leap from node to node on impulse whenever I see an association, draw connections between things that had not seemed related before I created the nodes for them, and contradict myself completely. In the two nodes shown below I can tell opposing stories without fear of breaking my contract with my interactor, because that contract specifies only that I seek the truth about myself in public—not that I create an externally coherent persona or resolvable story. This affordance makes digital creative nonfiction a wonderful way to explore who you are (even if it turns up things you’d rather not know about yourself). The experience of building daddylabyrinth, as well as the digital art and theory that I learned about in studying the conversations it brought me into, gives me hope that digital creative nonfiction can be a tool for self-understanding. Polylinearity exposes the raw wiring of the connections we make between nodes of our own life stories. As our computational capability grows, connectivity between an ever-increasing number of those nodes will become deeper and more powerful, and we will navigate them with far more speed than the point-and-click of daddylabyrinth. As the form evolves, we will collectively sink ever deeper into the well of associational thinking until digital creative nonfiction functions like the human mind: bursting from synapse to synapse and continually offering glimmers of understanding, while being gloriously unburdened by any need for coherence and false resolution. At times—especially when I imagine still adding to daddylabyrinth two or three decades from now—I think about the ways that data-harvesting organizations like Facebook organize the digital footprint of living and dead humans. The synaptic connections they make between narrative nodes take the fragmented moments of our lives and give them the sheen of fiction—a sense that our story can be understood and that we can be known. In other words, they offer us coherent simulacra. Conversely, daddylabyrinth and works like it are curated by human beings who are permanently enmeshed in their own subjective experience and permanently deprived of coherent resolution in their lifetimes. Our knowability is slippery. Preserving this human aspect in digital curation keeps connections between our story nodes on human terms rather than computational ones, allowing our imprecise minds to free themselves from the constraints that coherence puts upon us. Such endeavors remain messy by design—unresolved projects by (and for) unresolved people. daddylabyrinth is surely not alone in seeking this, and Scalar is not alone in allowing it. I can’t think about what I’ve learned during this project without mentioning Mukurtu, a digital archive platform developed for the Warumungu people of Australia by Kim Christen and Craig Dietrich. (The latter is, not coincidentally, one of the people behind Scalar.) Mukurtu allows the Warumungu to curate their cultural history with varying degrees of access depending on their affiliations and identities, and thinking about it as a tool for creative nonfiction—especially for community projects—makes my mouth water. In learning about new platforms like this, I see a great opportunity for a continuous thickening of the synapses that digital creative nonfiction allows us to draw between moments of human experience that we may not understand as we go through them—and still may not understand, as I know from daddylabyrinth, for much of our messy lifetimes. Steven Wingate is a multi-genre author whose work ranges from poetry to gaming. His books include the short story collection Wifeshopping (2008) and the novel Of Fathers and Fire, forthcoming from the University of Nebraska Press. daddylabyrinth premiered in 2014 at the ArtScience Museum of Singapore, and his interactive video Talk with Your Hands Like an Ellis Island Mutt premiered in Hong Kong in 2016. Both digital projects were first shown as works in progress at Electronic Literature Organization conferences. His interactive novel Boulderpeople is forthcoming from Choice of Games in 2018. He is currently an associate professor of English at South Dakota State University.